Leeds Stand Up to Racism action meeting – Tuesday 7 November, 6.30pm, Leeds UNISON offices, 160a Woodhouse Lane (opp Fenton pub) LS2 9EN – all welcome – come and get involved in the discussion on how to take on the rising tide of racism locally and nationally and plan future events. Speakers confirmed include Diane Abbott MP, Kevin Courtney NUT Gen Sec, Dave Ward CWU Gen Sec, Kate Osamor MP Shadow DfID Secretary, Catherine West Labour MP Hornsey and Wood Green, Claude Moraes Labour MEP, Shahrar Ali Green Party Home Affairs spokesperson, Lowkey, Talha Ahmad Muslim Council of Britain Treasurer, Maurice Wren Chief Exec Refugee Council, Moazzem Begg former Guantanamo Bay detainee, Clare Moseley Care4Calais founder. 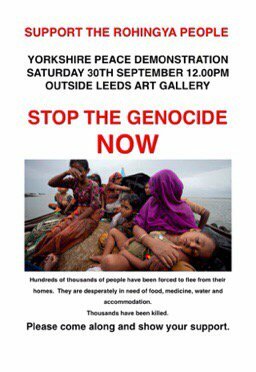 Other events – Yorkshire peace demonstration for the Rohingya people – Saturday 30 September, 12noon Leeds City Art Gallery.